IN THE past few years the central government has included different Indian languages in the 8th schedule of the Indian constitution by the recommendation of various committees. It shows prudence on the part of the Indian government in being flexible in recognizing the complexity of linguistic diversity in India. In 2003, the 93rd Constitutional Amendment was passed which enabled the government to have a fresh look at the possibility of inclusion of other Indian languages in the 8th schedule. Consequently, four languages, viz. Bodo, Dogri, Santhali and Maithili were judged to be included in the 8th schedule. We the people of Western Odisha were hoping that Kosli be included as well because our situation is identical to that of Maithili as it is explained in the following sections of this memo. Therefore, we humbly request you to examine our request by the same yardstick used to include the four recent languages in the 8th schedule of the Indian Constitution. It is said that the right of a mother tongue is a basic cultural right of the people which link them with their economy, socio-cultural system and political right. UNESCO has recognized that the concept of language equality among all languages is important irrespective of whether the languages have a script or not. Furthermore, the Indian government is promoting the mother tongue based multilingual education to reduce the school drop-out rates and to enhance communication using a mother tongue. This is a good and praiseworthy initiative taken by the Indian government. In this regard, the Kosli language (also called Kosli-Sambalpuri, Sambalpuri) is the mother tongue of ten districts of western Orissa (Kosal region) viz. Balangir, Bargarh.In addition, a large population of Raipur, Mahasamund and Raigarh districts of Chhattisgarh state also uses Kosli language as their mother tongue. The Kosli language and literature is vast as it is blessed with a group of dedicated writers. 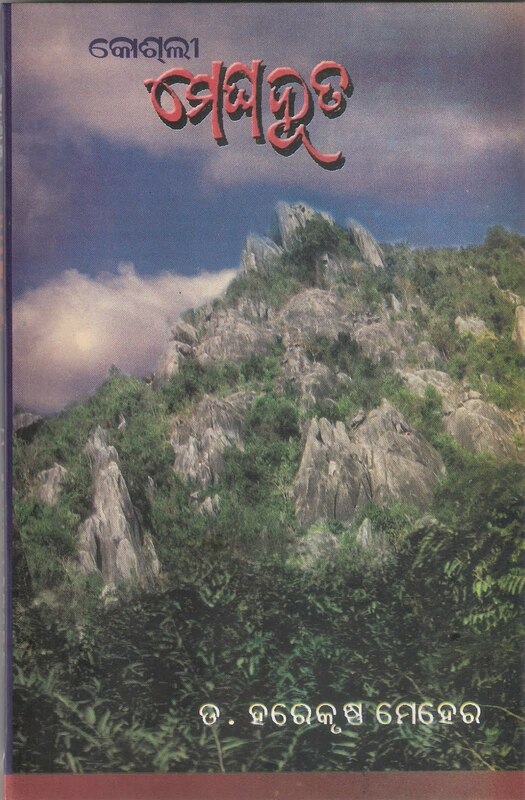 A large number of books are published regularly and available in the Kosli language. Epics such as ‘Ramayana’, ‘Mahabharat’ and ‘Meghduta’ are translated into Kosli language. Kosli language has a rich literature in different areas viz. Architecture, Astrology, Mantra-Tantra-Yantra science, Medicine, Yoga, Music, Arts, Dance, Drama, Yoga, Philosophy, and Grammar. Kosli dramas, songs, and dances are popular across the world. Kosli dramas are highly acclaimed and regularly staged at various places of India. For instance, a recent Kosli language play ‘Maau’ is aiming to enter the Limca record book by becoming the biggest ever stage show of its kind in the world. The Kosli language cinema is attracting worldwide attention. ‘Bukha (Hunger)’ a Kosli language movie has won the Indian national award, an international jury award at the Gijón International Film Festival, Spain and was selected for World Rural Film Festival, Aurrilac, France. The All India Radio (viz. Sambalpur, Balangir, and Bhawanipatna) and television channels (viz. Nxatra news and OTV) are broadcasting their news and entertainment programs in Kosli language. More than five registered newspapers and seventy magazines are available in Kosli language. Unfortunately, Kosli language has no political and official support although there was a discussion in the Indian parliament to include Kosli language in the 8th Schedule of the Indian constitution. Recently, the Odisha government has recommended the Ho language for its inclusion in the 8th schedule of the Indian constitution. This is a welcome step. Along this line, we sincerely hope that the Odisha government will recommend Kosli language for the inclusion in the 8th Schedule of the Indian constitution. For the people of western Orissa it is not just a language but a way of life that propel progresses and harmony in the region. The inclusion of Kosli language in the 8th schedule of the Indian constitution will have following positive impacts on the people of western Orissa. The key to development of western Odisha is the Kosli language. Drop-out rate in schools particularly in rural and Adivashi area can be ascribed to, among other variables, teaching in Odia language which is not used in day to day communication. It is as if learning through an alien language. Kosli is the dominant means of communication throughout western Odisha. Though we have several tribal languages, all tribals have functional capability in Kosli not Odia. That is the main reason why KBK has been found literacy rate is so low. We also have large population of scheduled caste in the area who are similarly impacted. It has caused various problems viz. i) the overall marks of students from western Orissa are lower than the students of coastal Orissa and ii) many bright students of western Orissa fail again and again in both 10th and 10+2 examinations because of their poor knowledge in Odia language. Recognition of Kosli language will facilitate education among the kids of western Orissa in their mother tongue and solve the above mentioned problems. Freedom of expression in legislative and social sphere: In spite of aggressive Odianisation, population of western Orissa has retained Kosli language for day to day communication. In large population centers where people of other states, especially from Bihar, Jharkhand, Chhattisgarh, Bengal, Punjab, Gujarat and other North Indian area have come to work, they have opted Kosli instead of Odia because the accent of Kosli follows North Indian pattern. And when poor Koslis go out of their area to seek employment they choose to go to other Hindi speaking area such as Chhattisgarh, U.P, Bihar and Jharkhand instead of Odia speaking area in Odisha. Inclusion of Kosli language in the 8th schedule of the Indian Constitution will promote the culture and heritage of western Orissa. Keeping the above mentioned points into consideration we request you to recommend the inclusion of Kosli language in the 8th schedule of the Indian Constitution. 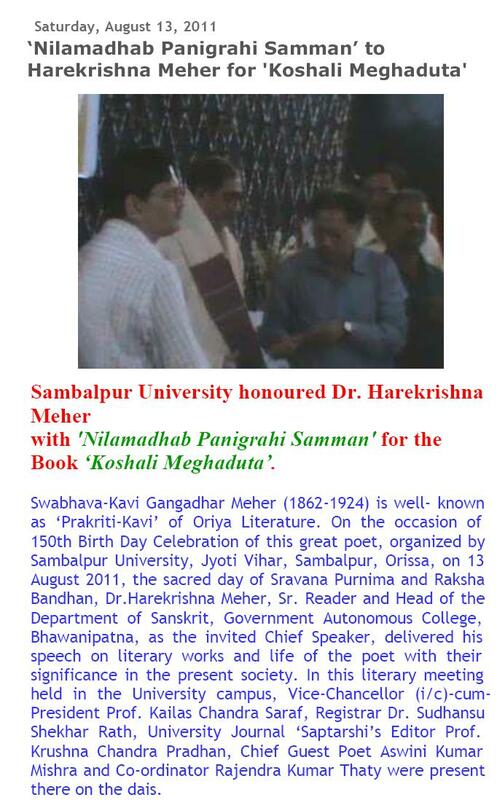 Under the auspices of Swabhava-Kavi Gangadhara Meher Smruti Samiti, Barpali, Orissa, and Balangir Bhulia Meher Samaj, Balangir, the 149th birthday of poet Gangadhara Meher was celebrated with pomp and ceremony in Town Hall, Balangir on the sacred day of Sravana Purnima, 24 August 2010. Several important persons spoke on the occasion. Dr. Harekrishna Meher, Sr.Reader and Head of the Department of Sanskrit, Government Autonomous College of Bhawanipatna delivered his speech as Chief Speaker on the life and literary works of Gangadhara Meher (1862-1924), well known as Prakriti-Kavi. On the same day, World Sanskrit Day and Raksha Bandhan were also observed. On this occasion, “Koshali Meghaduta” (lyrical translation of Kalidasa’s Meghadutam in Koshali language) authored by Dr. Harekrishna Meher was released by the honourable Chief Guest Prof. Dr. Dhrubaraj Naik and it was appreciated by the learned audience. 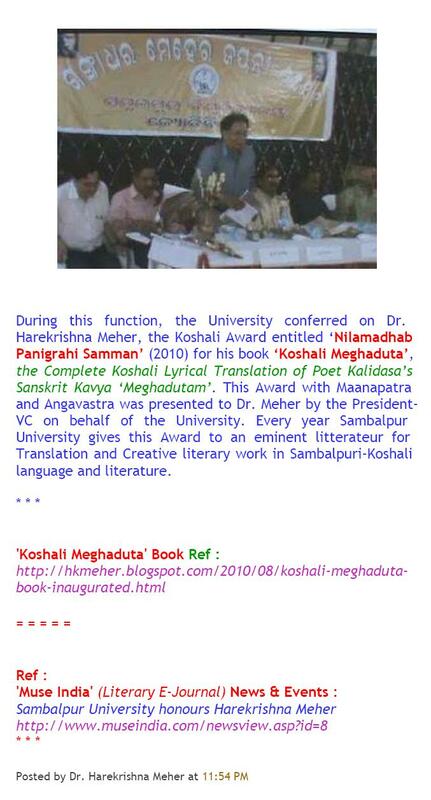 This book is the first Koshali translation of Meghaduta.